Seamus Heaney (right) at an anti-apartheid demonstration in Dublin, 1985, protesting at the import of South African fruit by Dunnes Stores. In late August 2002, Seamus Heaney visited South Africa to receive an honorary degree from Rhodes University and to participate in a tribute to Rhodes professor Malvern Van Wyk Smith. It was his first and only trip to Africa. During this visit Heaney and his wife Marie also met their longtime friend Kader Asmal, a South African politician and who had lived in Ireland and lectured in Law at Trinity College Dublin in the 1970s and 1980s. 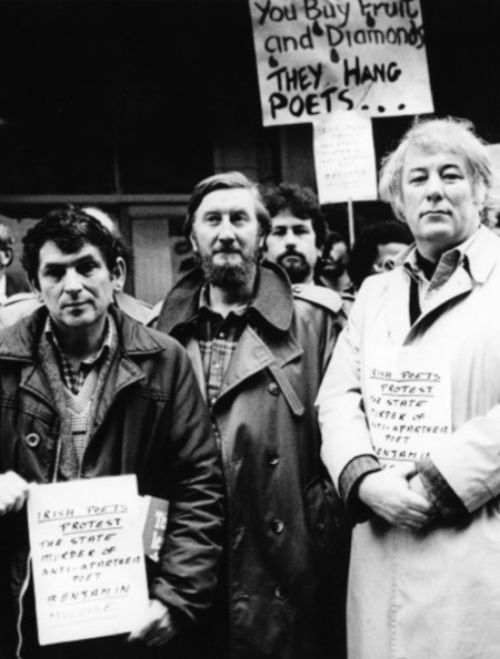 Asmal had founded the Irish Anti-Apartheid movement – of which Heaney was an active supporter (he seen here at a demonstration in 1985) – and returned to South Africa in 1990. By the time of the Heaneys’ visit twelve years later, he was Minister for Education. In addition to receiving an honorary doctorate, he also delivered his lecture ‘The Guttural Muse’ and gave a poetry reading at the chapel on the Rhodes University campus, from which the three recordings below are taken. They include introductions of the kind for which Heaney became famous – providing context and insight on the impulses and inspirations behind each poem. In this case, his early poem 'Digging' and what the poet calls two 'little wonder tales', 'Lightenings viii' and 'St Kevin and the Blackbird'.